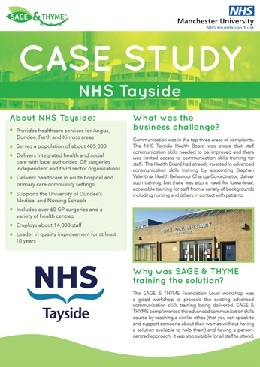 NHS Tayside adopted the SAGE & THYME training to complement their advanced communication skills programme. The aim was to enable all staff in contact with patients, from a variety of backgrounds, to be taught how to listen to patients using a person-centred approach. Nearly 100% of people who have attended the training would recommend it to others. Staff, including healthcare support workers, say that they have more confidence in speaking to patients and carers about their concerns and show that they have learnt key aspects of effective communication. To find out more about the benefits of the training to NHS Tayside, click here to go to the case study page.